Create the extraordinary life you deserve with a Personal Results Specialist today! Do you tend to control the events in your life, or are events controlling you? The amount of stress you feel is directly related to how in control you feel about your life. As the stress piles up, your sense that you are in charge of your life can slip away even further. You feel like you’re a spectator in your own life, helpless to do anything but watch as things happen to you. There’s a way to change that. If you want to stop letting other things control you, then you need to take control of your own mind. It’s all about reshaping the way you think about yourself and your life. If you’re ready to make that change in your life and regain control of your direction, the best thing you can do is focus on your vision. What does your ideal life look like? What do you most want to leave behind when all is said and done? That’s your vision – your dream. That’s what you need to fix at the forefront of your mind. When you focus on vision instead of everything going on around you, you’ll sharpen your ability to get what you want and make yourself more resilient against the bleak thoughts that can crowd your mind when you’re stressed out. What we choose to focus on – and the way we talk to ourselves about that focus – has a massive effect on how we feel. If you focus on the things you can’t control, such as the past, all the things you’ve failed at or what’s missing from your life, it’s easy to lose your vision. We’ve all been there – life seems to crush something that you were excited about, or someone betrays you, or you betray yourself. Once you let yourself think in that way, the stress will creep in. You’ll soon feel overwhelmed and even depressed. This is the origin of that loss of control, that sense that you aren’t in command of your own life. You’re a manager, an operator – not a creator. Leaders focus on what they can control, what they have and what they want. Once you change your focus in this way, you’ll stop being a manager and become a creator once again. Deciding to focus on vision means determining the way you want your life to go. To create a life where you’re thriving, not just surviving, you must focus on creating a compelling future. Pick anything – a goal, dream or desire – that you want so much, you’re going to find yourself compelled to make it happen. Don’t be modest or shy about what you want to do with your life. Dream big. What legacy do you want to leave behind? How do you want people to remember you? What would you have to accomplish in order to look back at your life and say, “I have no regrets”? If you think about it, you’ve actually already done this before. Whether or not you’ve been keeping track of it along the way, there are things that you’ve wanted and have gotten for yourself. You are responsible for everything that you have in your life today. That means you’re also responsible for everything you’ll have in your life going forward. If you want to thrive, you have to focus on the things you can control, the difference you can make and the things that are already in your life that you’re grateful for. Work out the important things you want to accomplish in your life. Maybe that’s starting your own business to leave your family financially secure. Maybe that’s traveling to every country in the world. Maybe that’s looking after all the hungry in a particular city. No vision is too large. Nothing happens overnight. All good things in life take time and effort, and even that can hang up those of us fully driven by vision. Accept that you will not change the world in a day. You’re starting with yourself – and changing yourself has a ripple effect that will change the world. The key to achieving your vision is setting achievable, intelligent goals for yourself. Each small milestone is one step closer to your vision and the life you want to live. Break your vision into smaller portions; for example, if you want to help families put food on the table, your early goals might involve donating to charities that feed the hungry, then becoming involved in those charities by helping them distribute the food. From there you can build out the goals until they ladder up to where you want to be. As you do this, keep your eye on the prize. Focus on what you want, not on any setbacks you may encounter. When you focus on vision, many elements in your life will fall into place on their own. Things that used to be massive stressors will seem minor in comparison. You understand that you aren’t just encountering one blow after another; no matter what happens, you’re still working toward your vision, toward what you want your life to be. And once you remember that all life is a work in progress and that changes and minor problems do not need to derail you, you’ll experience true breakthroughs. The truth is our life is really the only thing in the world we can control. 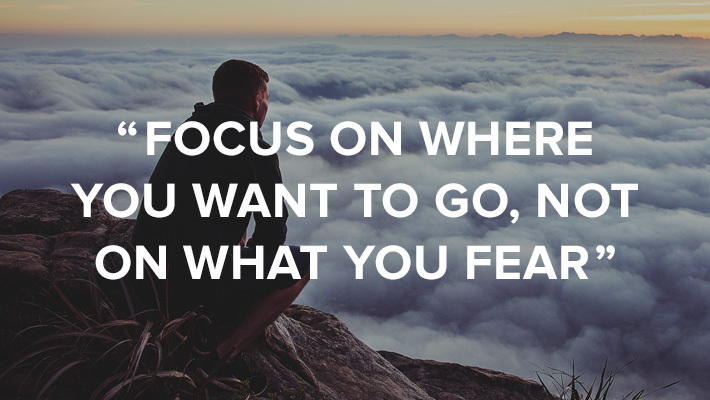 Focus on your vision and let the stress fall away – your life is waiting for you. Commit to focusing on your vision by attending Unleash the Power Within. 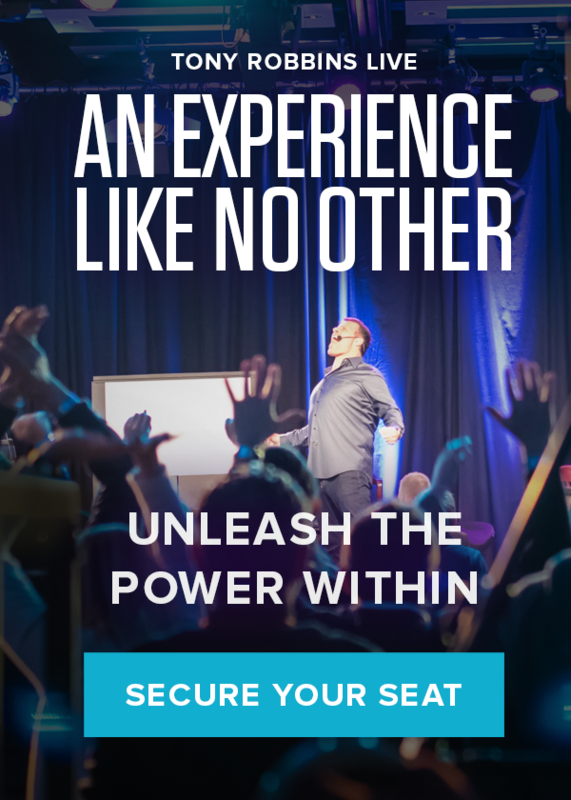 This 3 ½-day event with Tony Robbins will give you the strategies and confidence you need to create massive change in your life.